The second pigment in my Sunday in the Park with George set was organic red lake. It wasn’t as easy to find examples of as vermilion, as you can tell by the image above which does not contain the result of a Google search but instead shows the color swatch from a paint brand. The color is a deep red with some yellow undertones. Looking back, I think I strayed more in the direction of blue, but as the other two red drinks were on the yellow side I don’t regret that mistake since it produced a tasty drink. Stir and strain into old fashioned over ice glass. Twist lemon peel and discard. One thing I wanted to do with all of the cocktails in the series was to use a different base spirit for each, and, for the most part, different bitters and mixers as well (juices I wasn’t as worried about). And yet, here in the second drink I resorted to Peychaud’s to help the coloring. I tried to be better from here on out. I love aged rum as a base, and here I used Mount Gay Extra Old, though Bacardi 8 or Ron Zacapa would work equally as well, I think. The Crism added a floral sweetness, and is not a mixer I used a lot, as I discovered when I emptied my bottle in preparing this drink for my cast and couldn’t find a replacement anywhere. It seems it has been so long since I purchased the bottle that it is no longer made in the form I had it before. It was either bought or rebranded, but I believe it is now found through this company and now is simply called Fruitlab Hibiscus Liqueur. As I have not found a bottle, though, I cannot say if it tastes the same or (less importantly) provides the same color. You could substitute another sweet floral liqueur, like St. Germain perhaps, though of course that would produce a different drink. The Maurin Quina is a great ingredient that I have been playing with a lot in the last several months. 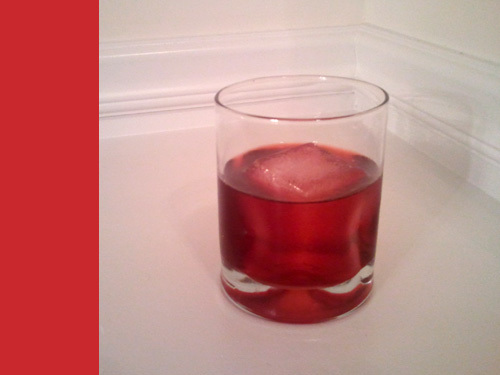 It is a quinine and cherry based aperitif that adds a wonderful tart/sweet/bitter -ness to a drink. Finally, the added bitters contributed greatly to the color, but also toned down the sweetness, though the Fee Brothers cranberry definitely have a sweetness to them in addition to their tartness and bitterness.